Biting is a natural instinct for your bird. He uses his beak to convey an assortment of different messages to both humans and other birds. You should not panic if you notice that your birds are biting one another on occasion. You should only be concerned if the behavior continues long-term and your birds are injuring one another. Biting is a sign of displeasure in the avian world. If your bird is biting you, chances are high that he is either frightened or angry. When your bird is biting his companion, there is a good chance that the companion has upset your bird in some way. The cause of the biting can be as simple as one bird taking a treat or toy that the other bird wanted or it can be a warning sign that your birds personalities are not meshing well together. Birds are often territorial. When there is more than one bird, you can expect one individual to be dominant over the other. Your birds may bite or peck at each other while initially establishing dominance and the behavior may periodically continue as they interact with one another in their daily lives. If you believe your birds are biting because of dominance or territory issues, ensure your less dominant bird is still getting adequate access to resources such as food, water and toys. If you see one bird chasing the other away from toys, food or other desirable items in the cage then you can expect fights to break out. 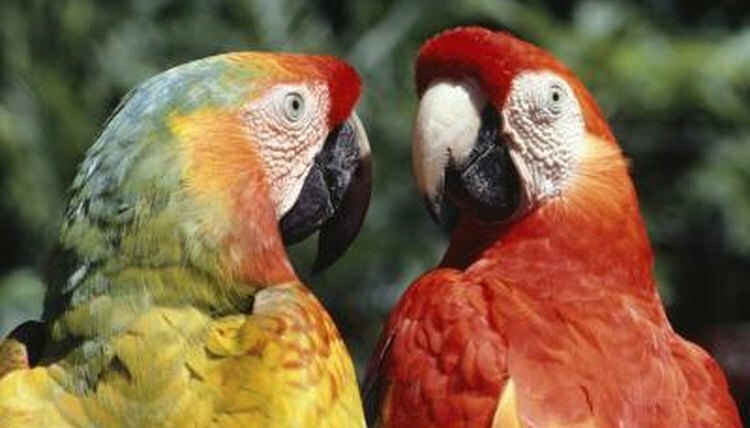 Your birds may have to separated if one bird will not allow the other to eat or drink. Biting can occur during mating season, especially when bird hormones are going full force. Mating season for different species of bird can vary greatly so it is important to research the type of bird you own and learn as much as you can about their mating behavior so that you can prepare to handle that behavior in a way that is appropriate for your type of bird. Males may bite one another and fight over a female's attention. Males may also bite at females during the courting and mating process. Juvenile birds use their beaks to explore the world. This behavior often comes across similar to the "teething" stage that young mammals go through. If you have a young bird, or a pair of young birds, who keeping biting each other, chances are they are testing out their environment as well as their companions. Young birds bite to explore, play, express unhappiness and sometimes just seem to bite for the sake of biting. A small amount of biting is normal and should not cause concern. However, if one bird continues to escalate the behavior, is biting the other bird frequently or is causing injury to the other bird then you may need to separate the pair. Birds, especially parrots, can bite with a lot of force and cause significant injury. You do not want your birds attacking one another and need to separate them immediately if they are drawing blood on one another or otherwise causing serious harm.